After a 12.5 hr. flight from Newark, NJ, I got to sit in transit at the New Delhi Airport in India for 15 hrs. For some reason it seems that all planes from the US arrive just after the last flight of the day to Nepal. Well I finally made it to Kathmandu and was picked up by my tour guide. 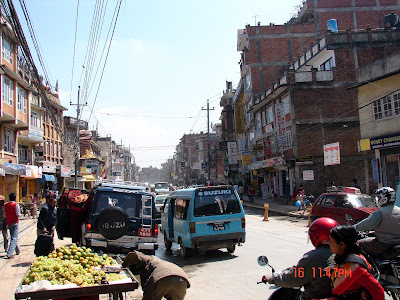 Then I got to witness the insane traffic of Kathmandu, a city of over 1 million, but only two lanes of traffic. But that doesn't stop 5 different vehicles from trying to drive side by side, weaving in and out with reckless abandon. 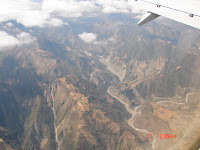 My viewpoint is see everything there is to see in one day and get out of Kathmandu. The street merchants are relentless. One followed me for 6 blocks until I threatened to get a policeman.